Whether you are a casual rider or training for an upcoming event, cyclists need to take great care when on the road during the winter time. When the weather gets colder and the terrain becomes unpredictable, you will need to consider a number of factors before heading outside. 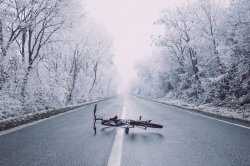 However, if you are hopping on your bike during the colder seasons we have put together this handy article discussing must-know information before you go. Covering the gear needed to stay warm and visible to discussing the alternatives to outdoor training, have a read below. 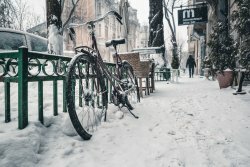 Is Winter Cycling a Good Idea? Cycling is a fantastic hobby to have and can give you a number of goals to achieve in the process and when training for an event you don’t want the colder seasons to put you off your plan. However, it is possible to train indoors on a cycling machine during those days where the temperature drops below freezing and the ground is covered in ice and snow. As avid cyclists are highly motivated to succeed, if you are considering taking your bike out over the winter months, you must certainly prepare and take proper precautions while you are out. Make sure you wear the correct clothing and amount of layers to ensure that your own body temperature can be sustained without overheating from too many layers or freezing from less. You would also need to take into account the terrain of where you want to cycle; if the paths are ice-free then you are good to go. However, if you are unsure of the weather and if it could suddenly change while you are outside, it is best to plan your route carefully. Sticking to shorter routes and those near to shops and cafés or your car are great for if you get caught out. Some more casual cyclists may decide to take a break over the winter to enjoy the festivities and other hobbies indoors, and this is absolutely fine too. After all, your body needs chance to recuperate from all of the intensive exercise over the summer months. Therefore having a break for a little while will give you the relaxation you need while providing you with an enhanced level of focus and determination when you get back on your bike. As the temperature outside is much colder during the winter, you would most certainly need to prepare your cycling kit in advance of the season to be sure you have everything you need. Below is a list of must-have clothing and accessories to help keep your ride stress-free and comfortable. Jackets are always a great idea for riding in the winter, however sometimes you just need that extra layer to protect you from the wind. And this is where a lightweight jacket comes in really handy. As it can be compacted down, you can find that this can be easily stored on the body in a pocket. This means that you will always have it to hand when you need it the most! Eye wear is a fantastic accessory to have with you when riding in the cold temperatures. You will often find that when cycling against colder air your eyes will begin to water and you will lose focus easily. However, by wearing a pair of clear glasses you are well shielded from the breeze. There are also various types of lenses available for these such as tinted ones to improve your view from the dull dark days. Instead of wearing thicker layers on your feet then putting your boots on, over shoes are a great way to keep your toes warm in the winter. The fabric simply pulls on over your shoes with specialised holes for the cleat. Commonly made out of neoprene or water resistant fabric, these handy accessories keep you toasty and warm when you need it most. One of the most essential items you need to consider is having high quality base layers. This type of clothing sits close to the skin and traps the heat within to help regulate your body temperature to keep you warm. Therefore it is vital that if you are going to splash out on any item of clothing, it is these. Some high-quality gear also includes a moisture wicking technology which prevents sweat and moisture build up when you are warming up. Gloves are also another must to have when riding in the cold. The best types of gloves to look for are those with a longer wrist on them. This therefore ensures that they meet your jacket sleeves seamlessly which will prevent any cold air getting in. Reflective panels and fluorescent clothing are an essential when riding outside in poor conditions. These items of safety gear work by reflecting the lights from car headlights to allow other road users to see you. This is vital for almost any type of cycling when the visibility conditions are low, but they are especially important in the winter when the nights start to draw in. When you are thinking about going outside in the cold, it is instinct to think to put more and more layers on. Which is correct for cycling, however you do not want to have your layers too restrictive as they will become uncomfortable in the long run. Therefore it is ideal to wear your base layers, tights and top, followed by a jacket to keep you warm. As when you begin your ride you will feel much colder compared to while you are on the move, so you would also need to take this into account when choosing your outfit. Hand warmers are very portable and pack a lot of punch when it comes to producing heat. When these are activated they can be placed in your gloves to keep your hands warm. Or another neat way is to place them in your back pockets to combat the chill of the cold air against your spine. It will also be handy to take a hot drink with you in a flask depending on how long you are out on your ride for. These can be easily fixed to your bike using a bottle holder and you can stop and have a sip whenever you like. This therefore allows you to heat your body on the inside as well as staying hydrated. Another great way to reduce the effect of the cold outdoor weather is to place your gear over the radiator before you get dressed. This will make your clothing nice and warm when you come to put them on before your ride. And you will instantly feel that bit cosier before heading out into the cold. And finally, a head cover can be worn underneath your helmet to prevent the chilly air from coming through. Retaining the heat on your head is achieved by this excellent accessory as most helmets contain ventilation holes and in the winter when the wind breezes through it can make it very uncomfortable. Most manufacturers produce a specially designed bike made for winter conditions. Therefore if you are an avid cyclist and are working hard at a training program all year long, you may want to invest in a specialist bike specifically for the winter. This will come in handy then as you will not need to update your regular road bike with the necessary essentials for the winter. As the ground will be wet and slippery you would most certainly need to look into investing in some decent winter tyres for your bike. These are often more bulky and have better grip against the road surface to improve your speed and accuracy while outside. Another great idea to have fitted to your bike for the winter would be some mud guards. This is because when snow begins to melt it produces sludge and this can make a mess of your tyres and your bike. Therefore, by having some high-quality mud guards on your bike will make your experience more pleasurable. It is a good ideal to cycle with front and rear lights throughout the year, but in winter when the days are often overcast and dull this is even more important. Investing in good lights is a must to ensure you can be seen by other road users. You should always carry spare batteries with you to ensure you don’t end up without lights mid-ride. Have you Cycled in the Winter Before? Throughout this article we have taken a look at clothing and accessories needed to improve your winter riding experience. And if you have ever gone out in the colder seasons before or are thinking of preparing to this winter, let us know over on our social media pages. Simply get in touch and we would love to chat about all things cycling! You can also take a look at our online webstore – Sports Fitness and stock up on all of your cycling equipment needs!